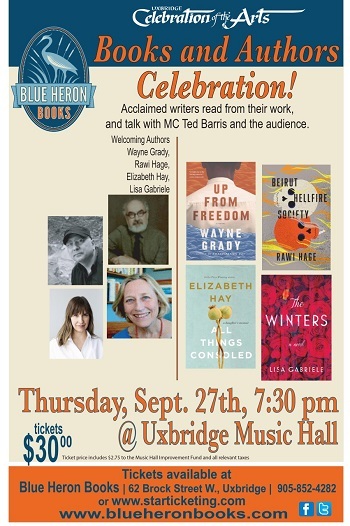 Acclaimed writers read from their work, and talk with MC Ted Barris and the audience. Welcoming Authors: Wayne Grady, Rawi Hage, Lisa Gabriele and Elizabeth Hay. ELIZABETH HAY is the author of the #1 nationally bestselling novel Alone in the Classroom, the Scotiabank Giller Prize-winning novel Late Nights On Air, as well as four other highly acclaimed works of fiction, His Whole Life, A Student of Weather, Garbo Laughs, and Small Change. Formerly a radio broadcaster, she spent a number of years in Mexico and New York City before returning to Canada. She lives in Ottawa. WAYNE GRADY is the award-winning author of more than a dozen works of nonfiction and is also one of Canada's top literary translators. His debut novel, Emancipation Day was longlisted for the Scotiabank Giller Prize. Grady lives in Kingston, Ontario, with his wife, the novelist and creative nonfiction writer, Merilyn Simonds. LISA GABRIELE is the author of Tempting Faith DiNapoli and The Almost Archer Sisters, and is an award-winning TV producer, writer and director. Her writing has appeared in Vice, Nerve, New York Magazine, The Washington Post,The New York Times Magazine,The Globe and Mail, National Post, Elle and Glamour. Her essays have appeared in several anthologies, including The Best American Non-Required Reading. She's also the author of the internationally bestselling S.E.C.R.E.T. trilogy, under the pseudonym L. Marie Adeline, a series that's been published in more than 30 countries. All tickets are $30.00 and include all taxes, ticket fees and Music Hall Improvement Fund.